3.4 Torpedo Wall of Sound, only a speaker simulation? This manual describes the Torpedo Captor and provides instructions for its operation. It is highly recommended that you read this document before using the product. The contents of this manual have been thoroughly verified and it is believed, unless stated otherwise, to accurately describe the product at the time of shipment from the factory or download from our website. This document is the exclusive property of OROSYS SAS. In the interest of product development, OROSYS SAS reserves the right to change technical specifications, modify and/or cease production without prior notice. OROSYS SAS cannot be held responsible for any damage, accidental or otherwise, that results from an inappropriate use of the Torpedo Captor. Please refer to the safety instructions included in this manual. The reproduction of any part of this document is strictly forbidden without the written authorization of OROSYS SAS. All product names and trademarks are the property of their respective owners. Product names and trademarks found in this document were used during the development of the Torpedo Captor product but are in no way associated or affiliated with OROSYS SAS. The Torpedo Captor must never be used near a heat source, near a flame, in the rain, in damp areas, near any liquid of any sort. When transporting the unit, care needs to be taken to avoid any shocks that could cause damage that would require the assistance of a qualified technician. Do not connect to the Torpedo Captor an amp which RMS power is over the admissible power of the Torpedo Captor (100W RMS). The power sent to the load is turned into heat, so please follow the cooling recommendation of the loadbox — otherwise overheating may cause damage, both to the loadbox and to the amplifier. The Torpedo Captor is a loadbox. 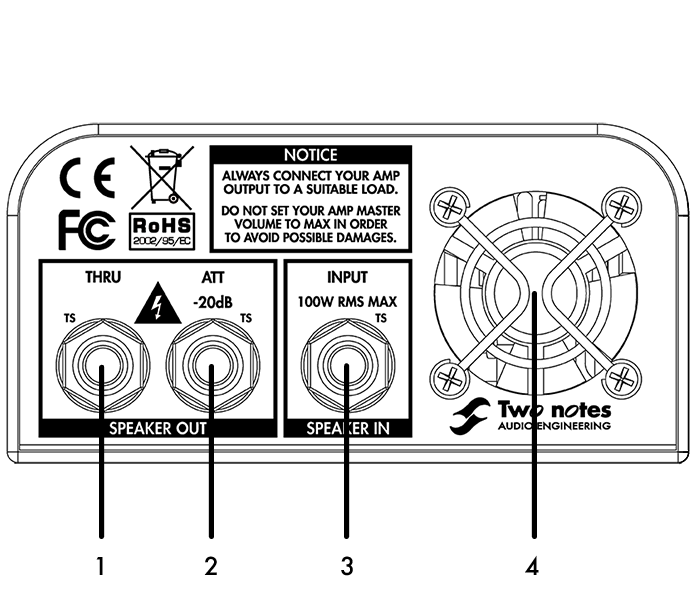 This term indicates that the Torpedo Captor is a load which can electrically replace the speaker cabinet while dissipating (transforming into heat) the power coming out of the amplifier. Within the Torpedo Captor is a Reactive load. A Reactive load simulates the complex impedance of a real speaker. Always connect the speaker output of your tube amplifier to an appropriate load (speaker cabinet or loadbox). The Torpedo Captor is such a load. The Torpedo Captor does not need to be powered up to act as a loadbox. The maximum admissible power of the Torpedo Captor is 100W RMS, your amplifier shouldn't be set to play at a higher output power value. See this article if your amplifier is more powerful than 100W. You may hear some noise coming out of your Torpedo when playing, like there is a tiny speaker inside the box. This is perfectly normal and there is no reason to worry. The sound is produced when power goes through the coil of the reactive load embedded in the Torpedo Captor. The vibration is related to what power comes out of the amplifier connected to the Torpedo and to the signal’s frequency content (notes played are heard). Your amplifier may also produce similar noise, at the output transformer’s level. Such noise is usually not heard, simply because it is normally overcome by the sound coming from the loudspeaker. The Torpedo Captor embeds a fan, as there is quite a lot of power dissipated into heat inside the box. We selected a so called “silent fan”, but as it is running fast, it is never entirely silent. This said, you can consider that, in normal use (hearing your guitar through monitors, or headphones), you can barely hear that fan. The Torpedo Captor is the little brother of the award-winning Torpedo Reload. Captor is an easy to use reactive loadbox perfect for unleashing your favorite tube amp in a variety of modern applications and venues. If you just require attenuation from your amp to your cab, Captor has you covered. And if you want an easy and modern way to record your tube amp, Captor is simply “load” and record ! The Torpedo Captor provides a number of very useful functions, quickly described hereunder. A more detailled description of each function, their various options and how to use them, can be found later in this manual. If you wish to keep a cabinet on stage, the Captor features a direct speaker THRU or ATT output. It allows for full volume or a fixed – 20dB attenuation. The Captor provides a DI output for your amp. The DI XLR output is phantom-powered for ease of use, and features an ultra-transparent op-amp buffer. Use it to pick up the sound of your amp on stage, or to virtually add an amp input to your sound interface. The Torpedo technology was created as a solution to the high pressure musicians commonly have to deal with: lack of time, limited gear availability, loud amplifiers they cannot play at desired volume, or bulky and heavy cabinets to carry. In addition, many musicians are more comfortable with their analog amplifier and effects pedals, and are reluctant to perform using digital modeling systems that may compromise their playing style and sound. Two notes has developed a unique technology based on an adaptation of convolution techniques. Starting with the measurement of an actual cabinet + microphone setup, the Torpedo products embedding digital processing can accurately reproduce the system as it was measured, as well as the microphone’s position in space. In order to take full advantage of these digital algorithms, the audio design of the highest quality guarantees a huge dynamic range and tone fidelity, and concurs in bringing the ultimate playing experience. The impulse response (IR) of a system describes it behavior under the form of a very detailed filter. The convolution technique uses IRs to simulate the behavior or particular systems, such as reverbs, speakers, EQ, etc. It is the most accurate way to simulate sound signatures that are linear (i.e. without distortion) and time-invariant (i.e. no effect like modulation, compression, hysteresis…). It is particularly well suited for speaker miking simulation. 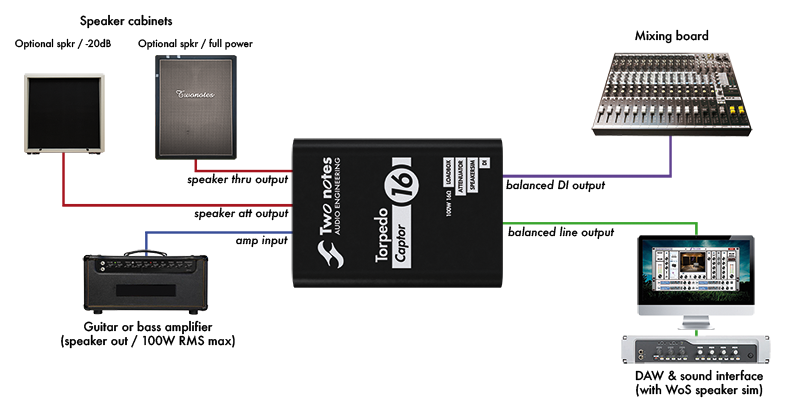 The Torpedo Captor comes with a Torpedo Wall of Sound plugin license. Torpedo Wall of Sound offers a “virtual” alternative to traditional miking to achieve a degree of realism never experienced previously with simulators. The musician simply plugs the Torpedo Captor in place of his/her cabinet, connecting the amplifier’s speaker output to it and without modifying any of his/her usual settings (or connected effect pedals as applicable). 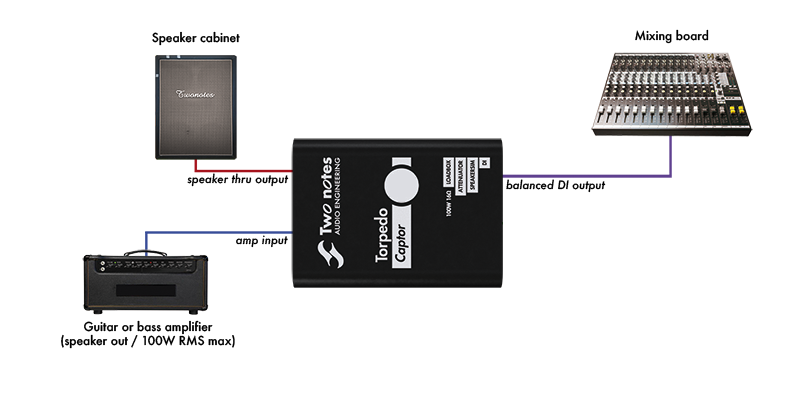 From there, the Torpedo Captor Loadbox output signal can be sent to any microphone preamplifier and that signal recorded thanks to your DAW on a track embedding the Torpedo Wall of Sound plugin. Torpedo Wall of Sound comes with a library of 16 cabinets and 8 microphones among the most commonly used models in the world. You will achieve perfect virtual miking by choosing one cabinet and one microphone, and fine-tuning the position of the microphone in front of the cabinet. Torpedo Wall of Sound is a plug-in software you can embed in your recording program. The plug-in should be used on tracks containing guitar or bass signal recorded from a preamplifier (guitar, bass, or any product with a line output) — or from a loadbox like the Torpedo Captor if you want to record the signal coming from the speaker output of your amp. to provide a signal that is the closest possible to actual guitar/bass miking as achieved traditionally in a professional studio environment. shape the signal (Low Cut, Eq, Exciter and Comp sections). With each step, Two notes Audio Engineering implements its know-how to bring you the most advanced simulations on the market and ensure perfect realism both for the musician (playing sensations) and for the listener (sound quality). Note: the Torpedo Captor comes with a 16 virtual cabinets usable with Wall of Sound. Torpedo Wall of Sound handles any kind of instrument track. When using a guitar/bass preamplifier with other speaker emulators, the guitarist/bassist may miss the power amplifier’s contribution to the overall sonic texture. Many musicians get their sound from some particular use of that element and the Torpedo Wall of Sound offers you the possibility to do the same. Two notes has developed an original tube stage modeling, which allows you to choose between 4 different tube models in Push-Pull or Single Ended configurations. You can push this tube stage like a conventional amplifier and look for that subtle yet particular distortion. If the Torpedo Wall of Sound is used as a super-DI for keyboards, this feature that was originally developed for guitarists and bassists can also be very interesting to warm-up the sound of a synthesizer, organ or a digital piano. During a guitar/bass sound miking session, it is a common practice to apply some essential processes on the signal before sending it to the recorder or the front mixing console. a powerful compressor to control the signal’s dynamics. The Torpedo Captor offers a solution for silent and quality sound pick-up in many situations. The following diagram presents the various connections of the Torpedo Captor. Only the amp is mandatory, all the other connections can be omitted. Please note that this diagram doesn't show all the wiring possibilities of the product, just the most common ones. All functions can be used separately or together. Please keep in mind that tube amplifiers MUST be connected to an appropriate load (cabinet or loadbox). Always plug the speaker output from your amp to the speaker input of the Torpedo Captor. 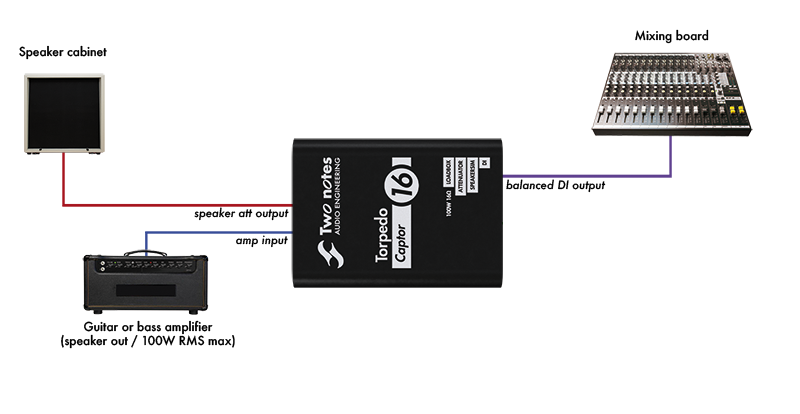 The speaker output of the amp connects to the SPEAKER INPUT of the Captor. You can't miss this input : it's the one with the red nut. Use a standard speaker cable for this connection (a pair of insulated conductors with no shielding). The impedance of the speaker output of the amp should match the impedance of the Torpedo Captor (ie, if your Captor is an 8 ohms version, use an 8 ohms speaker output on your amp). There is an exception to this though, if you are using the THRU output. Please refer to the THRU section for more explanations. Admissible power and thermal security: The Torpedo Captor is rated for 100 watts (assuming proper ventilation). Don't exceed that power, or the Captor will overheat and go into thermal security. This will cut the sound of the amplifier, putting it on a security load. If this happens, stop playing immediately. The Captor will resume correct operation after being allowed to cool down for a while. The loadbox is cooled by a fan. Never cover or restrict the ventilation openings (on both the front and rear panel) or the unit may overheat and go into thermal security. The phantom or external power supply is not needed to use the loadbox. If you connect a speaker cabinet to the THRU output, the internal loadbox is disconnected: your amp is directly connected to the speaker cabinet. As a result, the impedance of the speaker cabinet plugged into the THRU output should match the impedance of the amp. In this situation, the impedance of the Captor doesn't matter anymore: for example, you can use the 16 ohms output of your amp and a 16 ohms speaker cabinet in the THRU output, even if the Captor is a 4 or 8 ohms version. The THRU output is useful to insert the Captor between your amp and speaker cabinet, as a mean to simply pick up the sound of the amp. You can keep a speaker cabinet on stage for direct monitoring, and still get a properly picked-up sound with speaker simulation in the PA.
Use a standard speaker cable between the THRU output and the speaker cabinet. The ATT output provides a -20dB attenuation. Just plug a speaker cabinet in the ATT output (use a standard speaker cable for this connection), and crank up your amp while keeping a manageable volume. The speaker cabinet plugged in the ATT output can have a different impedance than the amp. However, this will lead to changing the attenuation ratio, which may vary from the designed -20dB. Using a speaker cabinet with a higher impedance (for example a 16 ohms cabinet on a 8 ohms Captor) will lead to less attenuation (approximately -15dB). Using a speaker cabinet with a lower impedance (for example a 4 ohms cabinet on a 8 ohms Captor) will lead to more attenuation (approximately -25dB). You can use both the THRU and ATT outputs at the same time, but the speaker at the ATT output will be much quieter, so it doesn't seem very useful. 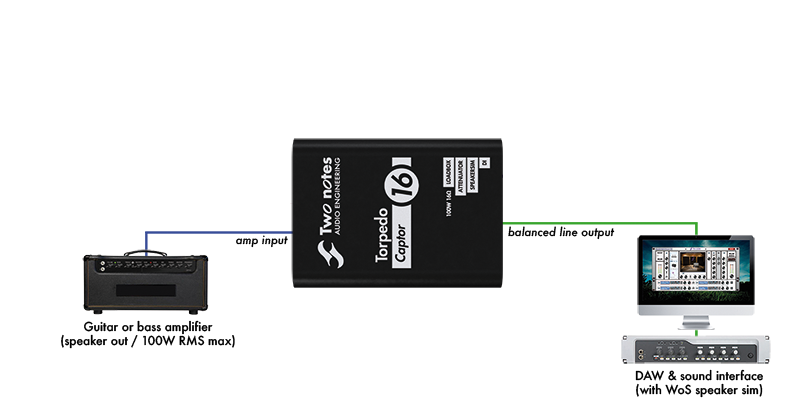 The LINE output of the Captor connects to any product with a line input: an audio interface, an FX processor, another Torpedo product, and so on. This output is dry, meaning there is no speaker simulation applied to the signal: it's the raw signal coming straight out of the amp, from the SPEAKER INPUT. This dry signal should be processed with a speaker simulation before being monitored. Once the LINE output is connected to an audio interface and a DAW, the signal can be processed with Wall of Sound. Please refer to the Wall of Sound section for more details. Another possibility is to use a Torpedo hardware product to do the speaker simulation. 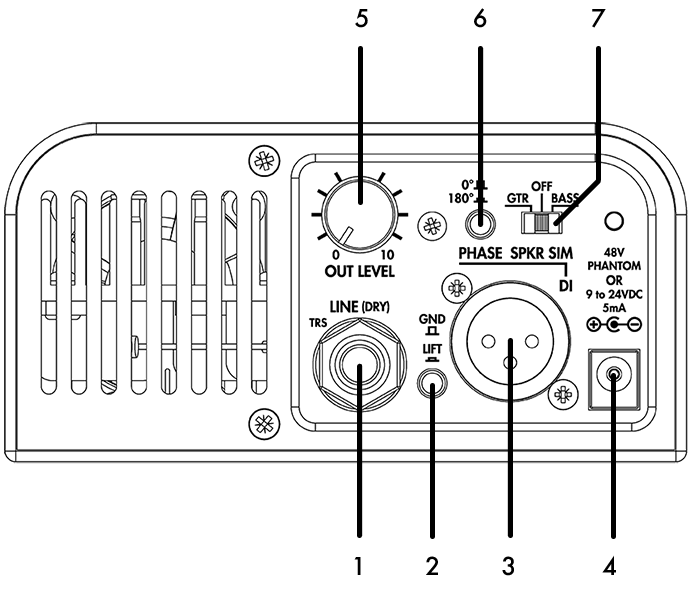 For example, the LINE output can be connected to a Torpedo C.A.B. When connecting the LINE output to a balanced jack input, use a balanced TRS jack cable if possible. Using an unbalanced TS jack cable (a standard guitar or patch cable) is possible, but may lead to added noise or interferences. The level of the signal can be adjusted with the OUT level potentiometer. The phantom or external power supply is not needed to use the LINE output. 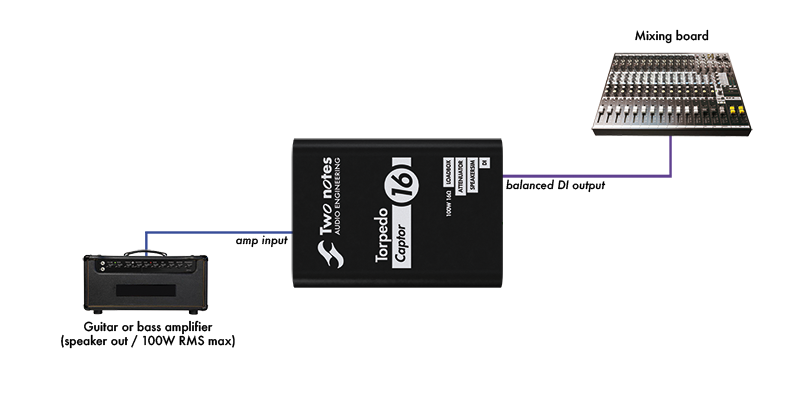 The DI output of the Captor connects to any product with a mic input, usually a mixing console or audio interface. Contrary to the LINE output, the DI output includes a speaker simulation, which means it can be monitored directly, without using an external speaker simulation. The polarity of the DI output can be reversed with the PHASE switch. This switch does not affect the LINE output. The ground of the DI output can be lifted (disconnected) with the GND/LIFT switch. It's often best to keep it in the GND position, but in some situations, lifting the ground could help prevent interferences. The DI output is active: it needs a power supply to work. The simplest way to power the DI output is to use the 48V phantom power from the mic input. Alternatively, you can use an optional power adapter. The speaker simulation embedded in the Captor is taken from our Le Preamp series. It's an analog simulation, featuring two models, Guitar and Bass, based on our Torpedo simulator. The Guitar model is based on our classic Brit VintC 4×12 picked up with a Dyn57. The Bass model is based on a mix of the vintage Fridge 8×10 and more modern Alu XL 4×10, picked up with a Cnd87. The speaker simulation can be turned OFF, in which case the signal at the DI output is the dry, raw signal coming straight out of the amp. The speaker simulation is not active on the LINE output. If you want to use the speaker simulation but need a jack connector, you can use a XLR-to-jack cable to connect the DI output to the jack input. Here are some examples of guitar tracking or live uses of the Torpedo Captor. If you have any question regarding your own setup or would like to see other possibilities detailed in this manual, don't hesitate to contact us on our Help Desk. Please refer to the above description of each feature for more details on which cable to use, what to pay attention to, or how to choose a specific setting that suits your particular configuration. On stage, the Torpedo Captor shines by its simplicity. First, insert the Torpedo Captor between the amp and speaker cabinet. Then, connect the DI output to the mixing console, turn on the 48V phantom power on the mixing console, and select either the GTR or BASS setting of the SPKR SIM switch. That's all, your amp is miked ! This configuration leaves the speaker cabinet on stage, allowing for a direct monitoring. An interesting thing here is that the amp is still connected to the speaker cabinet, and not to the internal loadbox of the Captor. This means the impedance of the Captor is irrelevant : you can use any version of the Captor to do this. In this configuration, the amp is connected to the internal loadbox of the Captor. This means you have to match the impedance of the amp's speaker output and Captor. Please note that, with either of these configurations, you can put a real microphone in front of the speaker and mix it with the DI output of the Captor. Alternatively, you can use either one as a backup for the other. If silent miking is needed for a silent stage, you can remove the speaker cabinet of the previous configuration. Just connect the amp to the Torpedo Captor, and the DI output to the mixing console. In this configuration, just like when using the Att output, the amp is connected to the internal loadbox of the Captor. You have to match the impedance of the amp's speaker output and Captor. In the studio, it's best to use the dry signal of the amplifier and use the Wall of Sound plugin, for a more realistic speaker simulation. Plus, recording the dry signal means the virtual miking can be done and fine-tuned after the actual recording. Just connect the amp to the Captor, and the line output to the audio interface. You'll have to route the input of the audio interface to a track in your DAW, and add the Wall of Sound plugin on this track. If needed, please refer to the manual of your specific DAW (and/or audio interface). Please note that, like with the stage configurations, you can add a speaker cabinet (attenuated or not) for monitoring, and maybe use a microphone to record a real miked track. You can also use the DI output to record a speaker simulated track. This way, you can record and mix up to three tracks : real miking, speaker simulation of the Captor, speaker simulation through Wall of Sound. I have an amplifier with selectable impedance All version will work. We recommand the 8 ohms version, because it's the most common impedance out there. 16 ohms version shows. The 4 and 8 ohms version have a 4 and 8 ohms loadbox, respectively, in place of the 16 ohms loadbox. Fan powered by the amp: the phantom or external power supply is not needed. Thermal security: the amp and musician work in security. Guitar or Bass, analog, based on acclaimed Torpedo virtual cabinets.